New LightHouse 3 OS is fast, fluid, and easy to learn. An uncluttered interface is easily personalized for your style of navigating. Rugged all-glass display optimized for flush or surface mounting. Sleek buttonless design with swipe-to-power control. 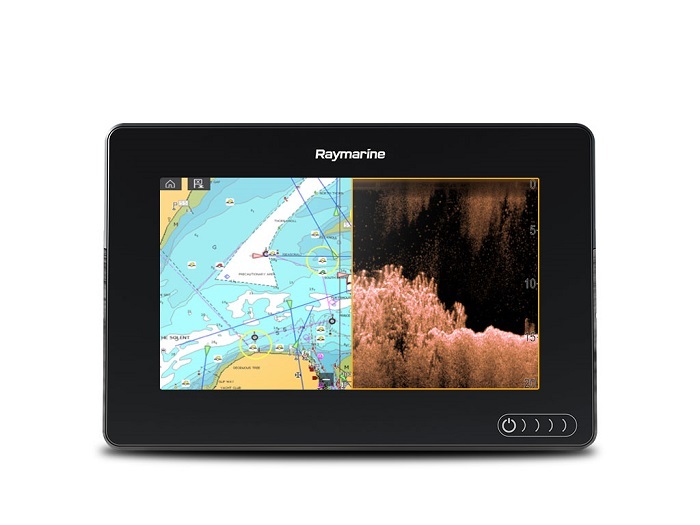 Support for the best charts from Navionics and LightHouse Raster and Vector Charts sourced from leading map makers like NV Digital, Blue Latitude, and more. Easily identify structure and locate fish with the life-like clarity of RealVision™ 3D sonar. Transmits on 60 different frequencies for the most life-like sonar imagery and simply the best fish targeting – hands down! Supports RealVision 3D, CHIRP DownVision, SideVision, High Frequency CHIRP, and 600 Watt (50/200 kHz) sonar. Navigate Safely at Night when connected to the FLIR M100 and M200 compact marine thermal cameras. Video Monitoring Make Axiom your video observation center. Add docking cameras or keep watch on the crew. View 4 video over IP cameras simultaneously. Radar Compatible with Quantum CHIRP Radar and Raymarine’s family of Digital, HD, and Super HD radars. High-Powered Black Box Sonar Axiom is compatible with CP470 and CP570 CHIRP sonar modules. Marine Audio Control Turn up the volume and control NMEA2000 compatible marine audio systems like Rockford Fosgate. Connect Axiom with NMEA2000 and SeaTalkng compatible devices. Ready to Network with Raynet Ethernet and NMEA2000. Connect multiple Axiom displays or expand with Quantum, HD radar, IP cameras, engine gauges, autopilots, instruments, and more.